I had been considering changing up my hair for a little while as I had finally allowed it to get to the point where it was almost entirely natural in colour. I do have somewhat of an aversion to cutting my hair, based on the fact that it is very thick and I have a lot of it, so those cute Parisian style bobs I always think would look amazing, never translate; I end up looking more like a mushroom or a lego man than trendy and chic as I'd like to. Also, I really do quite like having long hair; aside from the fact that drying it is a chore, I find that I can style it differently and it gives me the freedom to change other elements of the look, whilst keeping the length. I usually limit any cuts to either an inch or so off the length when the ends get a bit ratty, or chopping in a microfringe (usually by mistake as I trim my own fringe and sometimes this goes better than others!) but I've always been quite open to colouring it. I have coloured it myself on many occasions and first gave myself a dip-dye back in 2011! I always think that as long as you treat your hair with care, not too much can go wrong when it comes to dying it yourself, as long as you follow the instructions carefully! Dip-dyeing and ombre, however, are a little different to the more technical balayage which I was keen to try. Balayage involves 'painting' different sections of the hair with bleach to achieve a sunkissed look which I thought would be nice for a change. I felt that I'd done the dip-dye so often it would be nice to try something different. 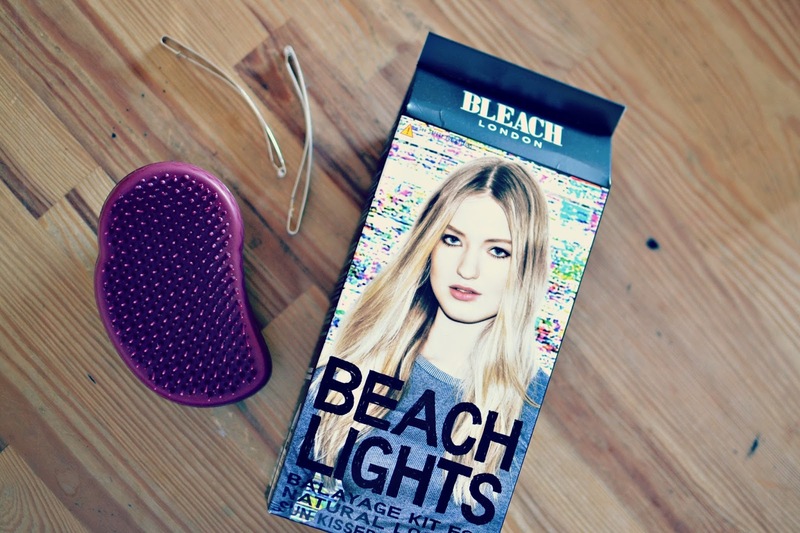 My natural hair colour is a fairly mousy brown, which takes bleach well and so when I spotted this balayage kit by Bleach London, I thought I'd give it a go. I've used Bleach London products before, their colours are lovely and I particularly liked the rose pink shampoo which gives a really soft warm tone to bleached hair. I had also heard good things about the balayage kit, I read a few reviews online and watched some YouTube videos on the product before I used it, so as to get a feel for the way that it worked. It is a simple bleach mix which comes with a 'balayage board' which is essentially a piece of plastic with comb teeth on one end. You select the piece of hair you want to bleach, and run the comb teeth through it from the top, allowing the hair to lay on the board. You can then apply the bleach from root to tip, or wherever you want the bleached effect to start. The first use of the kit was used with trepidation; I didn't want to accidentally end up with 90's chunky stripe highlights! I actually didn't use the bleach on the top layer of my hair at all; instead concentrating on the mid lengths and ends to get a more ombre effect. I was pleased with the result but decided to have a second attempt and bring some colour to the top of my head, again this worked well and I managed to create a fairly natural looking colour. I did struggle with blending the bleach into my natural hair colour without leaving a harsh line; I think this is something that hairdressers are obviously much more likely to achieve because they have had training! Whereas I have not! Although overall, I was pleased with the way that the look turned out. My hair is quite blonde now and I have invested in a silver shampoo as I have found that the bleach did make some of the sections of my hair quite brassy. I'm not sure if there was residual dye from previous attempts there but the silver shampoo has worked well in toning it out and making it look white rather than yellow. I use the PRO:VOKE range which is super cheap but really effective. I would definitely recommend this balayage kit, especially if you are looking for an alterantive to dip-dyeing and you feel confident in your ability to home dye. I also really like the conditioning mask that is included in the pack-essential for reviving fried hair!